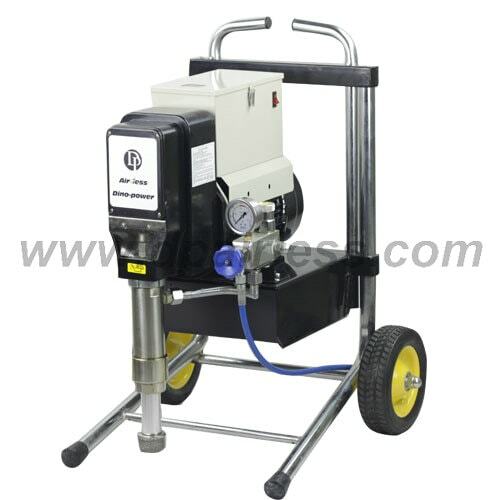 The DP-9600(E) Airless paint sprayer is Heavy duty Hydraulic driven Piston Pump sprayer. which is powered by Petrol engine or Electrical motor. Ideal for high viscosity materials, multi-gun use and working at heights. Sprays bituminous and fire retardant / fireproofing material, bitumen, epoxy, putty, plaster, spackling, block filler, gypsum,dry wall mud, white cement, all kinds of high viscosity materials or even 100% solid heavy material. Comes complete on Heavy Duty Trolley, High Flow Hydraulic Piston Pump, Airless Gun, 15 meters * 3/8 “ Hose, 1m*1/4″ whip hose, Airless Tip 643#, Base and Tool Set. Powerful high-performance pump -the power pack for large building projects and applying high viscosity materials. The material pump of the Heavy duty units is driven by hydraulic motor which is imported from Japan (Taiwan hydraulic motor is available with cheaper price). This has advantage that the shovel piston has a distinctly longer and slower stroke than with direct drive electric pumps. Our own improved bigger oil tank which contains of 13L hydraulic oil inside, much bigger than Wagner original machine which is only 5L. The more oil inside, the less temperature machine is operating, and less wearing for the spare parts. The low wear rate and the equipment are further positive aspects of hydraulic technology. The wear surfaces of cylinder and piston rod are coated with an extremely wear resistant layer of hard chrome, making them able to with-stand aggressive and abrasive materials. The pressure can be smoothly regulated up to 230 bar for perfect matching. We are interior & exterior painting contractor company. We would like to purchase a machine eletric powered for our projects. We would like to know a price and how long would it take to get it. can you please quote for me the item DP-9600(E) Hydraulic Airless Sprayer (Petrol Powered) including shipping quite for México please!! With full needed accessories for operation.